I should do a post on the American Museum of Natural History. It is a wonderful place to visit and was a favorite hangout of mine when I lived in the Big Apple. I left New York 48 years ago but still try to drop in when I visit. In 2011, the retired guy went to New York with his beautiful, younger, still-working wife. I went to the Museum to meet my undergraduate oceanography professor who is a Resident Research Associate there. Of course, I brought the camera. In the lobby/atrium of this great place founded by Teddy Roosevelt’s father is a prehistoric tableau. 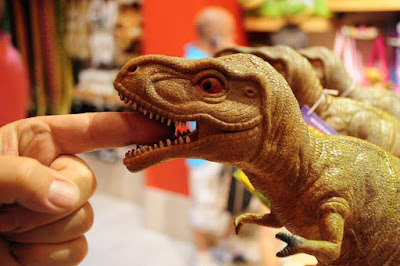 A Barosaurus, the tallest of the dinosaurs, is depicted as rearing up as a carnivorous Allosaurus attacks it. 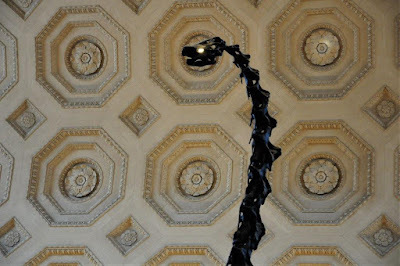 This cast reconstruction (real fossil bones are too heavy to be positioned this way) soars almost to the ceiling, 100 feet above the rotunda floor. I like the shot because it juxtaposes two disparate elements, the dinosaur bones and the fancy ceiling. Also, when composing a scene, it’s nice to be able to use the subject to block an unwanted feature…like a statue that hides a street sign behind it. In this case, the head covers a light fixture. Better yet, the bright bulb now adds a spooky quality to the creature. Finally, a Tip of the Day at no extra charge. The ceiling pictured here has another bare bulb light in the octagonal molding to the right of the head. By using the cloning tool, I copied the central portion of one of the moldings that had no light and pasted it over the distracting bright spot. Voila! That’s where digital post-production is especially useful.